It wasn't just Justin Bieber's fans who had "Bieber Fever" as the teen idol kicked off his national tour in suburban Phoenix. Video posted on KTVK-TV's website showed the pop star vomiting twice on stage on Saturday night during his sold-out concert at the Jobing.com Arena in Glendale. He left the stage after each episode but returned and even managed an encore. KTVK reported Justin's fans sang some of his songs while he was offstage and he later apologised for being sick. Justin later tweeted "Great show. Getting better for tomorrow's show!!!! Love u"
He later added: "And .... Milk was a bad choice!" Justin's 45-city "Believe" tour continues on Sunday at the MGM Grand Garden Arena in Las Vegas. Rapper Psy has become the first South Korean musician to make it to number one in the UK with his single Gangnam Style. Kings of Leon bassist Jared Followill and model Martha Patterson have tied the knot. Alicia Keys has revealed she "poured herself" into her new album as she showcased tracks at the iTunes Festival. Sir Tom Jones stunned customers at a London pub when he popped in to give a surprise performance. 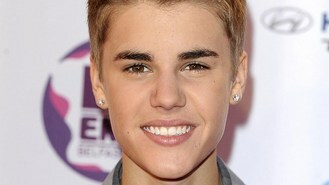 Justin Bieber was "created to do what he does", his mother Pattie Mallette has said. Stars of forthcoming West End musical Viva Forever! have met up ahead of rehearsals for the Spice Girls-inspired musical. Cheryl Cole is reportedly set to perform on Strictly Come Dancing. One Direction have revealed they got a bit of an eyeful when they were flashed by excited fans during a trip to Sweden.